Like most homeowners during winter, you would think that pest infestation would be the least of your problems. But, you couldn’t be more wrong. In fact, during the cold months in autumn and winter, animals and pests often seek warmth, shelter and food in your home. But, you couldn’t be more wrong. 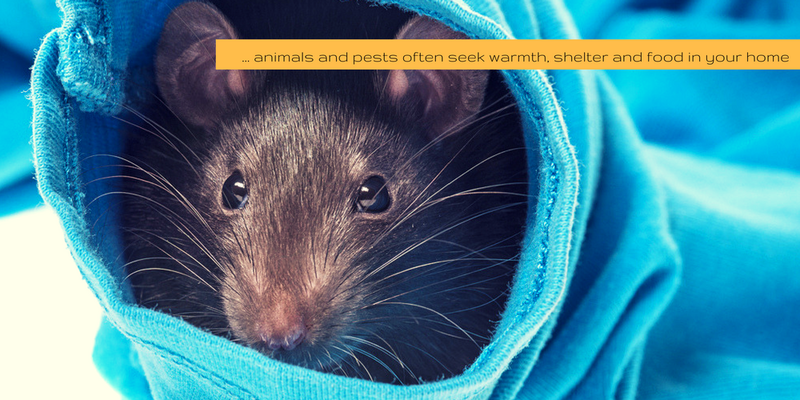 In fact, during the cold months in autumn and winter, animals and pests often seek warmth, shelter and food in your home. Some pests seem to favour no particular season when it comes to invading your home, and they are just as problematic in winter as they are during the summer. There are some that become an even bigger pain in the neck during the winter season. Here are some pests that you have to watch out. Rodents – Mice and rats are nocturnal and are quite good at hiding in the dark spaces and areas of your home, which is why it is hard to detect them until serious damage has been done. Not only do they carry diseases and fleas, but they also chew on wiring, which can result to fires. Roaches – These insects can be a big problem all year round. They may have short life cycles, but they breed often so a cockroach infestation can get out of control when not addressed immediately. Other Pests – Termites, ants, wasps, and mosquitoes can also invade your home during the winter. Getting winter pests under control. If you see signs of a pest infestation in your Hunter Valley home, you have to act immediately before it causes any more damage to your home and your family’s health. There are some rodenticides and insecticides in hardware stores that you can use to get rid of the mice, roaches, and other insects in your home. However, these chemicals are toxic and mishandling them may pose serious risks to your health, your family and your pets. For DIY pest control treatment, make sure to choose the least toxic pesticide that is best for the pest you are targeting and use it as sparingly as possible. You may also use snap traps for rodents, but make sure that you check them regularly. For a more effective and safer method, hiring a trusted local pest control experts is your best option. They would conduct thorough inspection to accurately identify what type of pest is infesting your home and where they are nesting. They are also trained in handling chemicals and have sufficient knowledge about the appropriate techniques and methods for pest control, making sure you and your family are safe. Before winter sets in, there are some things that you can do to prevent pests from invading your home. Keep food that may attract insects and rodents in tightly sealed containers like plastic or metal. Make sure that you don’t leave food, crumbs and liquid on the table or your floor. Tidy up. Keeping every inch of your home, both inside and outside, clean and clutter-free can prevent pests from nesting. Seal possible access points like holes and cracks on your walls, floors, windows, roof, and doors. Moisture can be great a magnet for pests, especially termites and mosquitoes. Inspect your home for leaks and puddles and address them as soon as possible. To ensure that your home is pest-free this winter, contact Local Pest Control, your No. 1 solutions provider for pest and termite treatment in Newcastle and Hunter Valley region.